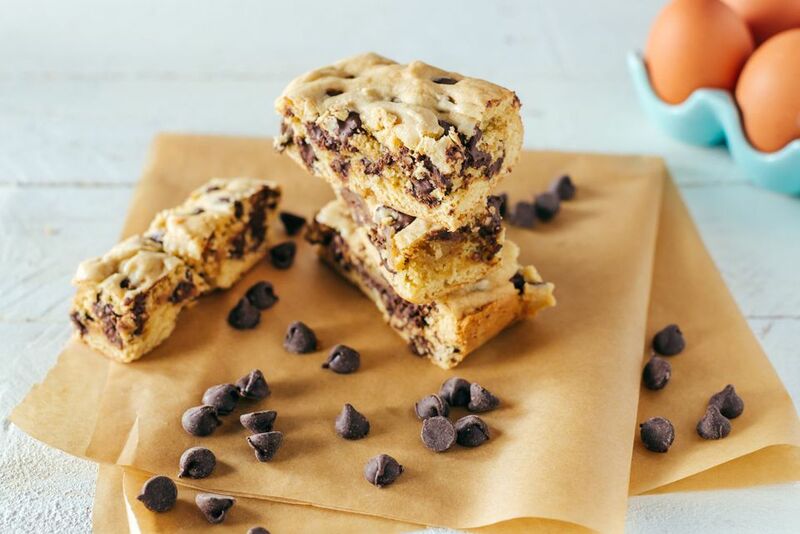 Easy to make and even easier to eat, these deliciously moist chocolate chip blondies are perfect for school parties and other get-togethers where a variety of diets will be present. During the holiday season, blondies also make a great gift! Preheat the oven to 350 F. Grease a 9 x13 baking dish and set aside. In a mixing bowl, combine the flour, baking powder, and salt, mixing until well-combined. Set aside. In a large mixing bowl, use an electric hand mixer set to medium speed and beat the soy margarine with the brown sugar for about 3 to 4 minutes or until creamy and fluffy. Add the eggs, one at a time, while beating the mixture. Add the vanilla extract and beat until the mixture is smooth and creamy. Gradually beat in the flour mixture until well combined. Fold in the dairy-free chocolate chips. Spread the mixture into the prepared pan and bake for 20 to 30 minutes, or until the top is golden brown and a toothpick inserted into the center emerges clean. Allow blondies to cool completely in the pan on a wire cooling rack before cutting into squares and serving.